The Purple Pinkie Nail Salon: Bling Week! The Discovery Channel has Shark Week, which is wildly popular. The Purple Pinkie has Bling Week! Well, at least it seemed it this week. We were blining out everything! We've had so much fun with bling this week that we decided to continue it through July! Get a set of Glitter Toes and add a second color for a fade for FREE! Get a full set of Funky French nails and get add a second color of glitter or colored acrylic AND an embedding like Moodies, Sequins or Mylar for FREE! 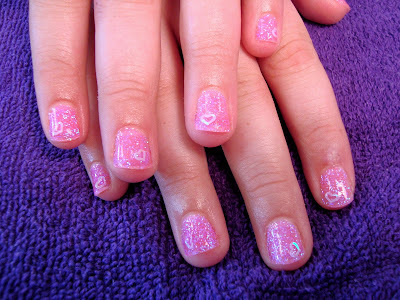 Magic Manicure with glitter and heart sequin embeds. Full Set with two color, glitter fade and Moody embeds. Glitter Toes with a two color fade. Full Set with two color, glitter fade. Glitter Toes with three colors, Patriotic theme! Natural nail overlay with two color, glitter fade and hand painted accents. 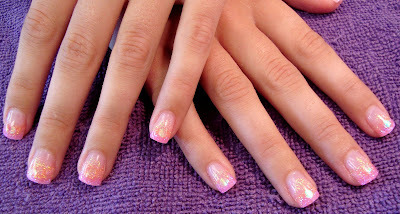 This allows the young client to grow her nails to the length that she wants and look stylish, while doing it! Now, do you all realize why I come home covered in glitter from head to toe? Life is good!